Sport fishing is one of the most thrilling activities for visitors to the Monterey coastline. Whether out on the bay or off the banks of the Carmel River, fishermen find that the local fishing spots offer unbeatable views and are stocked with aquatic treasures such as salmon, rock cod, albacore, halibut, trout and bass. Monterey County is truly the ultimate fishermen&apos;s fantasy! Be sure to check the California Department of Fish and Game website for information about sport fishing licenses. 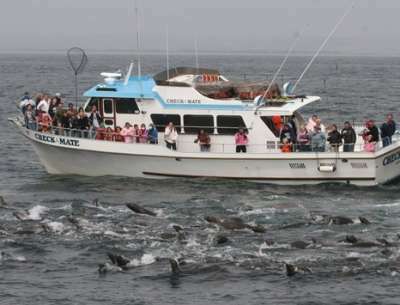 Several deep-sea charters on the Monterey Peninsula also supply visitors with one-day or annual sport fishing licenses. 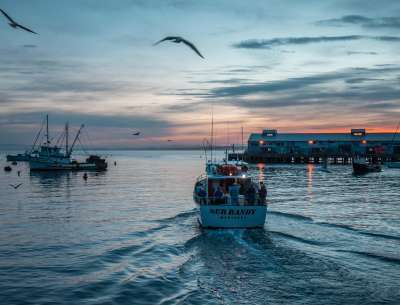 Boats depart daily, year-round for deep sea fishing on the stunning Monterey Bay. Depending on the current fishing season visitors can try their luck at salmon, albacore, rock cod, lingcod, halibut and rockfish. Several companies charter fishing trips right from Fisherman&apos;s Wharf in Monterey. See squid, salmon or deep sea fish with Chris&apos; Fishing Trips, featuring four quality boats and experienced skippers who know the bay. 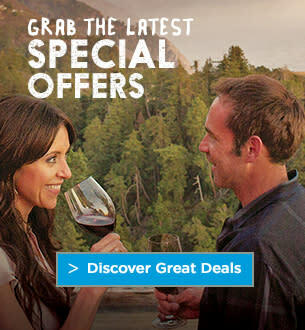 Try J & M Sport Fishing for unforgettable marine adventures on board their vessels. These businesses make deep sea fishing a breeze. Visitors can even rent full gear and purchase the required fishing licenses. Monterey&apos;s knowledgeable fishermen have several tips for amateurs looking to get the big catch. Captain Brian from Randy&apos;s Fishing Trips suggests that novice fishermen start with cod fishing as there is an abundance of this particular rockfish in the deep sea. 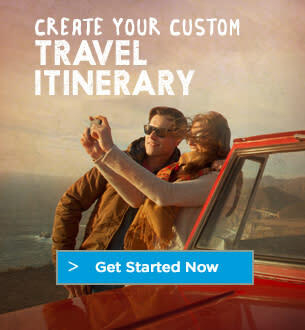 Make reservations in advance as trips can fill up fast. Be sure to pack plenty of water, a lunch and snacks since food and beverage are not available for purchase once on the boat. Most fishing trips will allow mates to bring beer aboard as long as it&apos;s not in a glass container. Even if the weather seems warm on the dock the ocean air can get frigid! Be sure to wear multiple layers, preferably waterproof. Rubber-soled shoes are recommended when on the slippery deck. Hats, sunglasses and sunscreen are essential, as you can still get burnt even if the sun is not visible. Let the crew clean and fillet your fresh catch for a minimal fee. Day fishers are not allowed to clean their own fish on the dock. The deckhand can get the job done quickly and efficiently. Many state parks in Monterey County permit saltwater fishing including Carmel River State Beach, Garrapata State Park, Limekiln State Park, Moss Landing State Beach, Zmudowski State Beach, Salinas River State Beach, Ford Ord Dunes State Park, and Marina State Beach. Surf fishers can expect to reel in halibut, stripers and perch. Don&apos;t be surprised if you aren&apos;t alone. Many of these fishing havens are popular spots for tourists also enjoying the spectacular views and recreational activities. Pack a jacket. You never know when the sea breeze will pick up. Look for rocks that provide access to deep water. You might be able to catch a lingcod if you are lucky. Use fresh bait, the fresher the better! Bring a bucket to fill with water to keep your catch as fresh as possible. Freshwater fishing is available at El Estero Park Lake on the fishing piers located on the Pearl Street bridges in Monterey. 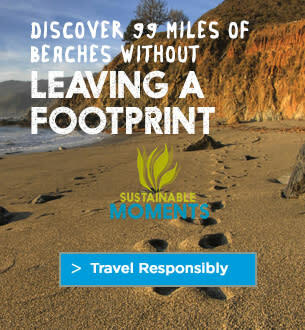 Other locations include Arroyo Seco River, Carmel River, Andrew Molera State Park, Pfeiffer Big Sur State Park, Lake San Antonio in South Monterey County and Cachagua Community Park and Los Padres Reservoir in Cachagua. Arroyo Seco Recreation Area on the edge of the Ventana Wilderness about 15 miles from King City also allows fisherman to cast for freshwater fish. Hopefuls in these areas can hook bass, trout, steelhead and catfish. Be patient. Pack a snack, book or radio as you may have some downtime before the big bite. Bring multiple types of bait. Sometimes it&apos;s difficult to see what fish are in the mood for. Clean up after yourself and allow others to enjoy the site as well.